The 29th Cinemagic Film and Television Festival for Young People, in association with Hagan Homes, returns to Belfast this October and November 2018, jam-packed with over 200 events and creative opportunities to inspire and motivate young people. The award-winning Festival, which is the largest film and television festival designed for, and by, young people in the UK and Ireland, boasts an ambitious and exciting programme of film screenings, world cinema, masterclasses with film and television industry professionals, school workshops, Q&As, and young critics panels. This year’s Festival kicks off on the 2nd October with the world premiere of Cinemagic’s second feature film, Grace and Goliath, a giant of a movie! It is an epic gem of a family feel-good film that is both hilarious and touching and will make you proud to come from Northern Ireland. As a Hollywood movie star is forced to stay with a Belfast family, his giant ego comes crashing down and a city unites. With a superb home grown cast and cameos from Ciarán Hinds, Suranne Jones, Sally Lindsay and Bronagh Waugh, Grace and Goliath is set to be the family film of the year! The film has already received fantastic international reviews. The opening weekend of the Cinemagic Festival will also be marked with a special preview of Smallfoot, the much-anticipated animated adventure from Warner Bros. Pictures. 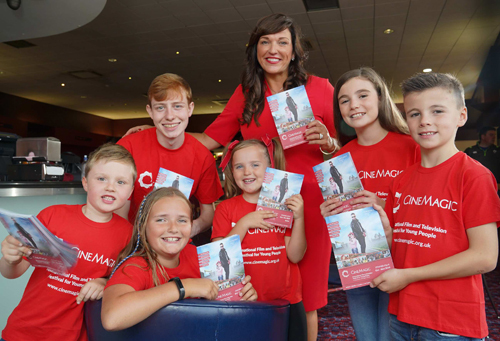 The Cinemagic Festival is funded by Northern Ireland Screen and is supported by the Department for Communities, Belfast City Council and Tourism Northern Ireland. To find out more about the Cinemagic Festival 2018 programme check it out here.